Subaru's Impreza WRX is being hailed by many as a legitimate road rocket. Inspired by the marque's championship rally vehicles, the 2002 WRX' secret weapon is a turbocharged, two liter four cylinder power plant that cranks out 227 hp and 217 foot pounds of torque. That's a shame, because there's plenty to like about this car, especially if you view yourself as any kind of enthusiast. Maybe the press car I got had seen one too many journalistic Walter Mittys, but some customer reviews of the WRX I read also mention low end grunt as one of their pet peeves, so maybe it wasn't just me. Oh, well. Besides the turbocharged power plant, the $24,000 (approximate base price) Impreza WRX comes with full-time all-wheel-drive, a very nicely set up fully independent suspension that imparts wonderful road feel (without excess harshness) and is eminently nimble, tossable, and predictable. The front suspension uses lower L-arms with liquid-filled rear bushings and stabilizer bar, while the rear suspension has parallel links and a stabilizer bar. Steering is rack-and-pinion with engine-speed-sensing variable power assist, and it has very nice feel. Subaru has done a really nice job on this suspension and the result is a car that handles extremely well. The braking system includes standard discs with ABS and the 16 inch aluminum wheels are mounted with Bridgestone Potenza performance-rated tires. 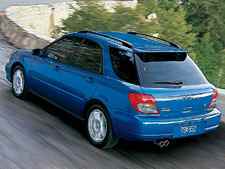 Subarus are built to be long lasting cars, but eventually Subaru Impreza brakes will need to be replaced. Protecting your investment with high-quality brakes from Parts Geek will keep the braking system performing well. On the whole, this is an attractive and roomy small station wagon with plenty of space for luggage or (when the 60/40 split rear seats are folded down), a bicycle, or just about anything else, within reason. The body style includes fog lamps, aerodynamic "ground effects" add-ons, a rear spoiler mounted over the tailgate, and a roof rack. The front seats are fantastic: they're kind of cup like, in that they not only have side bolsters but the seat cushion itself wraps around your posterior to ensure that once you hit those corners your body stays right where it should. I didn't have a chance to take the WRX on a really long trip, but I suspect it would be a very comfortable and enjoyable drive. The driving position is nearly perfect and I really liked Subaru's placement of the brake pedal: it's farther forward than on most cars I've driven recently, more on the level of the gas pedal and this facilitates "heel and toe" driving - though that's wasted with the automatic transmission. Some of the interior treatment seems a tad cheap, or at least not as up to snuff as some of this price range's competition. That said, Subaru throws in pretty well everything you'd expect in this type of car, including power everything, a six speaker AM/FM/cassette stereo with in dash 6 disc CD changer. The stereo is okay, but it also doesn't thunder in the manner of some of its competition. There's plenty of headroom, too, which makes the interior feel cavernous. Safety equipment includes the usual front air bags as well as front side air bags, while front passengers get height adjustable, 3 point seatbelts with pre-tensioners and force limiters. All three rear passengers get three point seatbelts. The Impreza WRX is EPA rated at 20/27 (manual) and 19/26 with the automatic. Gas mileage, not surprisingly, goes right into the tank when you insist on driving the car in the manner for which it was designed - but the same can be said about any vehicle, and the WRX seemed no worse than its competition in this regard. I wish I'd have tried the Subaru WRX with the 5 speed manual transmission, because the automatic's sluggish performance from a standing start really colored my feelings for it. If not for that I would have been delighted with the WRX' combined performance, features and "fun to drive quotient."